William Alvin “Bill” Denman was born in Gloversville, New York, on March 22, 1937 to Alvin Revelle and Katharine (McMahon) Denman and passed away April 1, 2019, in Mountain Grove, Missouri, at 82 years of age. His childhood was filled with ice skating, snow skiing, and sliding down the roof of his two-story house into snow drifts. Hunting and fishing trips into the Adirondacks with his father were also frequent adventures. Later in life, Bill made sure his grandchildren knew that he had to walk to school through deep snow, even when returning home daily for a hot lunch time meal. Athletics were a priority for Bill. He lettered in “six man” football, basketball, baseball and swimming. Bill was also a member of the drum and bugle corps which competed throughout the state. Cub Scouts and Boy Scouts were important to him as well. Later, Bill graduated from Syracuse University where he played football and enjoyed following his team to two bowl games. In the late 1950’s, Bill’s sister moved to Marietta, Georgia, when her husband accepted a coaching position. It was while Bill was attending a tennis match that the young tennis coach for the Marietta High School girls’ team caught his eye. Nedra and Bill met on that tennis court, and it was then Bill decided he loved the south and Nedra. While dating Nedra, Bill attended the University of Georgia with the intent of becoming a pharmacist. Bill soon realized pharmacy was not the career path for him. On June 25, 1960, Bill and Nedra were wed, starting a 59 year journey. 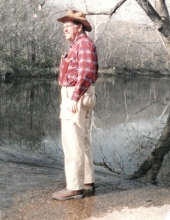 He worked as an industrial engineer at Lockheed Air Craft in Georgia for several years; it was during this time he convinced Nedra to buy a pair of matching horses. Bill and Nedra rode these horses in many parades. Bill enjoyed every minute; Nedra, however, polished up prayer skills at these times, constantly asking for God’s strength until her feet once again touched the ground! Bill loved horses, but most especially Pegasus, his beautiful white horse. Pegasus and “the Yankee” became part of the Kennesaw Mountain battlefield’s first re-enactment when they were asked to portray the parts of Traveller and Robert E. Lee, respectively. Bill’s work history was rich and varied. It included a paper route during middle school; working at a locker plant and as a lifeguard during high school; he was even employed as a cross-country pipe liner. He served his country for six years in the Georgia Air National Guard. After not finding fulfillment with working at Lockheed, and also learning that boarding horses in Marietta was very expensive, together, Bill and Nedra-the Yankee and the city girl-purchased their first farm. So began Bill’s 50 year love for farming and cattle ranching. To expand his knowledge, he attended the Herdsman Institute in Lee’s Summit, Missouri, where he showed cattle at almost all major shows. He raised and showed registered Angus and Shorthorn cattle. Raising their family on the farm provided many opportunities for Bill and Nedra to teach their children independence, the value of hard work, and appreciation for the idea that nothing worth having comes easily. Bill enjoyed the challenge of taking an average grass farm and turning it into an outstanding conservation farm. He did this both in Dawsonville, Georgia, and Mountain Grove, Missouri. Bill was always ready to help out the communities in which he lived. At one point, Dawsonville needed a Farm Bureau insurance agent and Bill needed a pole barn. He accepted the position at Farm Bureau, retiring from the agency 12 years later, long after the pole barn was completed. He volunteered to become an EMT for Dawson County, helping to establish Dawson County ambulance services. On a more personal note, Bill and Nedra often hosted foreign exchange students from Japan, Germany, Ireland, Holland, and Switzerland. Bill and Nedra were lucky enough to spend time traveling later in life, seeing such varied places as Romania, Poland, Hungary, Germany, Czech Republic, Austria, Ireland, Transylvania, France, and Italy. His favorite place to visit with Nedra was Sorrento, Italy, which he later described to his children as the most romantic place he’d ever been. Bill is survived by Nedra, his wife of 59 years, three daughters, Donna Pruett and her husband, David, of Valdosta, Georgia, Christy Hill and her husband, Brad, of Hanover, Pennsylvania, and Jill Zimmerman and her husband, Steve, of St. Vincent, Arkansas, one son, Bill Denman II and his wife, Shirlene, of Mountain Grove, Missouri, nine grandchildren, Sean Pruett and his wife, Mariah, Garrett Pruett, Tyler Denman, Cody Denman, Billy Hill and his wife, Olivia, Bradi Newell and her husband, Joseph, Brent Hill, Abigail Martinez and her husband, Javier, and Dawson Stice. They were also blessed with six great-grandchildren, Bentley, Jackson, and Henry Hill, Nicholas and Emilia Martinez, and Stetson Newell. Besides his parents, Bill was preceded in death by two grandchildren, Mary Margaret Pruett and Benjamin David Pruett. To send flowers or a remembrance gift to the family of William "Bill" Denman, please visit our Tribute Store. "Email Address" would like to share the life celebration of William "Bill" Denman. Click on the "link" to go to share a favorite memory or leave a condolence message for the family.